Groundhog Day on Kauai – Spring Buying Season? Yesterday was Groundhog Day. As the rest of the country counts days until Spring, on Kauai we only experience a slight shift of 3-5 degrees with a little more rain, wetter and a bit cooler… nothing newsworthy. But we’ve historically felt seasonal changes in the Kauai real estate market. When Punxsutawney Phil poked his head up on the beach, did he see buyers? Kauai real estate’s buying season used to begin mid-March and go through end of summer. In recent years, that hasn’t been as evident due to the national financial crisis. 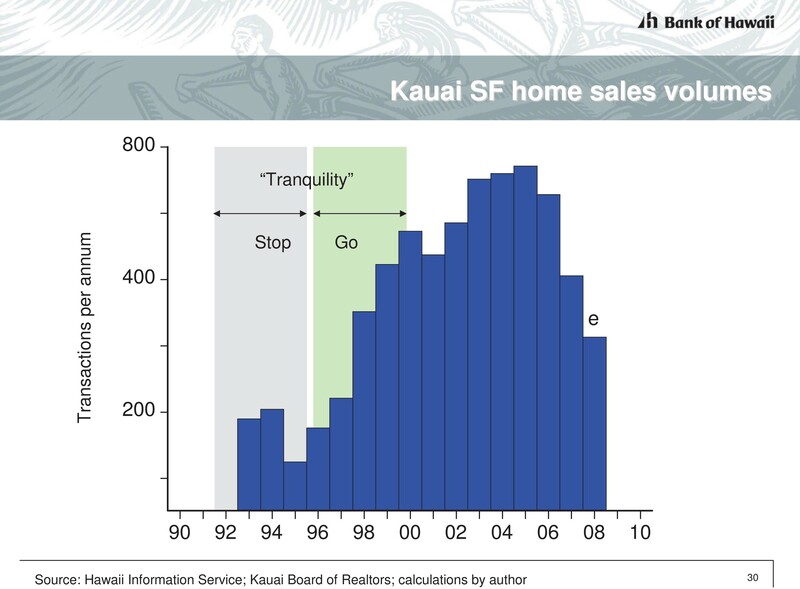 Buying activity on Kauai has been following the economic “mood” of the country. On the islands, we have our own real estate “Punxsutawney Phil“… Dr. Paul Brewbaker of TZ Economics, a leading economist for the State of Hawaii. Our yearly Groundhog Day for Kauai Real Estate is at the annual meeting of the Kauai Board of Realtors. Each year, Paul gives a humorous, detailed and insightful analysis of the current economic market for Kauai and the other islands. When’s the right time to buy? Of course, many personal factors come into play – it has to be the right time for you. But as activity increases, it’s more competitive. If it works for you financially, now seems to be the ideal time to negotiate. Once the ‘sound bytes’ determine it’s a time to buy – then you’ve missed the opportunity to take advantage of the “down market” and low interest rates. What’s your opinion – are we coming into a buying season? Lender approved price of $315,000 – waiting for your offer! Enjoy views of the Anahola Mountain range from your open great room. When you live as a small community on a rock in the middle of the ocean about 50 miles wide, it’s natural that we know what’s going on with each other. There’s literally no place to hide 🙂 The good part is people learn to live and let live. I’ve been to many gatherings where several “ex’s” and their new spouses were a welcome part of the extended ohana (family). The spirit of aloha truly at work. So what does that have to do with real estate? Well, the coconut wireless is active about the history of houses, just like relationships. This REO listing in Princeville is a prime example. It went into escrow this week at a reduced price of $650,000 after initially being listed for $807,900. I previously had this property listed as a short sale, with 9 different offers ranging from $698,000 to $775,000. In the midst of the market activity and offers, a local roofer found a problem that became a part of the Princeville coconut wireless real estate updates. In fact a buyer’s agent showed the house after having a “board meeting” about the roof while surfing that morning. Mind you, the roof report was never in writing. Even though we documented the needed repairs, pushed the lender to accept the current offers vs. a lower REO price – they remained non-negotiable. There were other properties in Princeville owned by the same lender where similar roof problems also led to a much lower final sales price. However, the lender wouldn’t negotiate from the appraised value that didn’t factor in cost of repairs. Just as with relationship news, the coconuts always get bigger with the telling. Houses, just like people, get a reputation that’s hard to get rid of. How do you effectively explain that to a lien holder based in New York?? Before listing, invest in a thorough home inspection report. You’ll then know up-front what your buyers will find. If you can afford to fix anything identified, fix it. If not, use the report as disclosure. It’ll make for stronger negotiations and a better bottom-line result, with less risk. If you haven’t already listened to the local song in this post, please turn up your speakers and give yourself a treat. For more local ‘kine music visit www.Mele.com. Kauai REO Buying Tip; Why do I need a buyers agent? Although not unique to buying REO’s, the risks involved in this approach magnify exponentially with buying a bank-owned foreclosure. The listing agent in all transactions represents the seller. Even if you agree to a dual agency representation, the agent is legally obligated to protect the seller’s best interest. Think about ‘War of the Roses’ – if you were going through a divorce, would you want the same attorney? Okay, now that we’ve had our movie minute – let’s get back to the Kauai foreclosure market. When a bank-owned foreclosure is listed, there is no sellers disclosure. It’s an “As-Is” purchase. In addition, lenders use their own contract drafted by teams of lawyers to protect them from liabilities. Who’s representing you? As a buyer, how are you going to find out what you need to know about the property? Your buyers agent needs to be part realtor, part detective on your behalf. From viewing the listing would you know that the property was vacant while unfinished for over a year? Is that a concern, maybe – maybe not. But it’s definitely information that you as a buyer should know. Here’s a video walk-through of the property prior to the completion of the finishing details mentioned in the listing – while it was marketed as a short sale. Working with our foreclosure buyers, we not only investigate the property through the normal channels, such as County Planning Department, previous listing details, Public Health records for the septic system, etc – but through our personal network with local builders, contractors and agents we often find the property’s untold story for you. Now that’s some power for negotiating….as well as important protection for you. For more information or to request a showing, please feel free to contact us at any time. 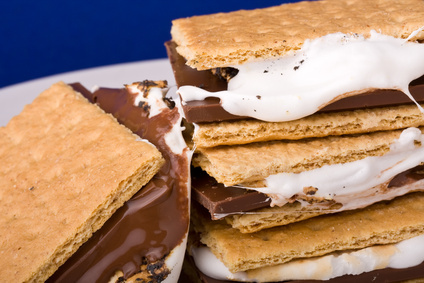 What’s firm, a little cracked and spicy on top and bottom – but gooey and mooshy in the middle? 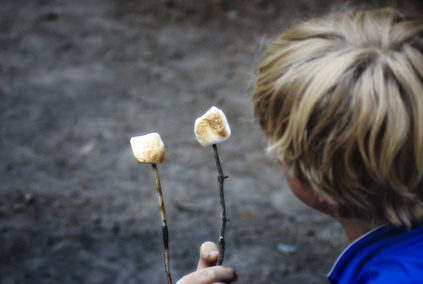 Smores? or the Kauai Real Estate market? Listings priced to sell – sell. But they have to compete with REO’s and short sales. Luxurious, unique properties eventually sell (with price reductions). It’s the listings in the “mooshy” middle that are not moving. Statistics in such a small market can be misleading. We can make charts with arrows, graphics and lots of numbers…but it may not be relevant to your “micro-market”. Add to that, what the high-end luxury sales do to our averages. What’s most meaningful is to get to know your own ”micro-market” with email updates from your agent, and customized market reports. Make sure the condition of your property is top notch! Yes, it’s a distressed market – but it’s a buyers market, and you’re competing, in a market that’s glutted with years of inventory. Price it to compete with short sales or foreclosures. Selling now is the best insurance against future loss. Find the “bulls eye” for your property, and price it there. Marketing and Sales Plan. Your agent should have an aggressive marketing plan, top technology skills and strong negotiating abilities. If you’d like more information about the Kauai real estate market or want to create your own analysis, contact us and let us know what part of the Kauai market you’re interested in. We’re here to help. In the early 80’s AIDS and Apartheid were new words. We danced to Bobby Brown, Paula Abduhl was one of the ‘fly girls’ on In Living Color and Beastie Boys rocked. It seems so innocent now, looking back. We met at cafe’s not Facebook, learned about world news through community events and newspapers, not Google and Bing. San Francisco was our home, a city of many communities. Protests, a part of daily life – some humorous, some serious. 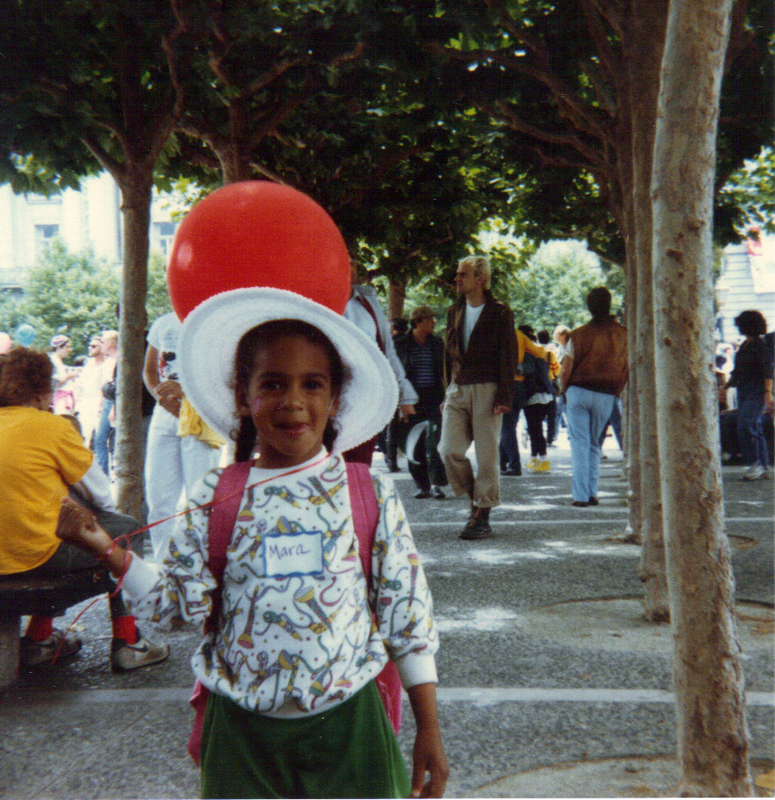 While my daughter was a toddler, we joined in a parade for MLK holiday- stroller and all. Stevie Wonder’s ‘Hotter Than July’, dedicated to the memory of Martin Luther King, Jr. touched our lives. ‘Happy Birthday’ became a family tradition. Every year on my daughter’s birthday, I’d wake her by blasting Stevie Wonder’s ‘Happy Birthday’ on yes, a turntable! Many people don’t remember the struggle it took to get this holiday passed and then observed nationally. “This is not a black holiday; it is a people’s holiday,” said Coretta Scott King after President Ronald Reagan signed the King Holiday Bill into law on Nov. 2, 1983 Read more. Help keep the legacy and spirit of Dr. King alive. Share your memories and thoughts…. Maybe I have a soft spot in my heart for Olohena Road, as that’s the area my daughter and I first lived when we moved to Kauai. The country location, tradewind breezes, lush vegetation and close proximity to town made it an ideal mix of upcountry privacy and convenience. This home has delightful architecture – truly island style, or as we call it a “Hawaiiana” floor plan. In the peak of the market, it sold for almost $1M. The location is on a corner that has some traffic, but the large lot still offers privacy. As a Bank of America REO offering there are special incentives to work with BofA on your purchase. I’d highly recommend Frank Lujan, based on Oahu. He has helped several of my clients, is professional, service oriented and can get the job done. For more information about this property, and how to buy a bank-owned REO property on Kauai – please feel free to contact me. You’ll find I’m easy-going and there’s no pressure. I’m here to help. 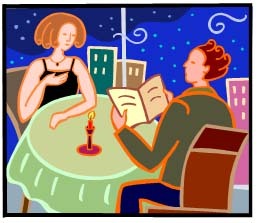 Your house is speed dating, and you may not know it! Imagine your home sitting at the table, waiting for a prospective “match” to spend 5 minutes to get to know all the wonderful features you know and love. Selling a home in today’s market is a mix between internet dating and speed dating. Kauai real estate buyers preview their properties online and narrow down a final list before arriving on island, or finding a realtor. As they say, you only get one chance to make a first impression. For your home, that means 5 seconds online. Want some help? Top 5 first impression success factors – how does your home measure up? Is there a virtual tour or video? What website is it on? If your home’s “match” shows interest, then what? To get 5 minutes to show off more special features, a YouTube video walk through works wonders. Just like dating, it doesn’t have to be polished, real is better. People want to know what they see online is what they’ll see in person. Okay, so your property made it past the 5 minute “speed date”. Now we’re getting closer to the first real “face-to-door” meeting. How does it look? Staging is critical to wow your home’s prospect upon arrival. A recent FrontDoor.com article highlights Top 10 Staging Transformations with before and after photos ranging from the mail box to a kitchen remodel. Most are very inexpensive. Cleaning, declutter and staging are critical to bring out your property’s best features. Just like no one wants to hear about a recent break-up or divorce on a first date, buyers don’t want to see your personal family photos and memorabilia. Contact me for a free consultation on staging and how to sell in today’s market. Short Sale Tales from the Crypt! Happy Halloween! Remember this scary guy from the 90’s? Working with Kauai short sales during the past 3 years, many times I’ve felt like we’re unwitting players in a ‘Short Sale Tales from Crypt’ series. Any producers want to try a few of these story lines…truth can be stranger than fiction! Going to auction without a loan! Just two weeks ago, my client received notice that her property was up for auction. We were confused, as this was not the primary or secondary lender we were actively negotiating with on a short sale. After talking to the Court Commissioner, pulling a new title report and sending it to him…we got word back from the lender’s attorneys that they were going to postpone the auction. Ya think? There was absolutely no record of this lender on the title report! This is a much more common scary story. I’ve had a couple of failed short sales, where the investor behind the primary lender refused to negotiate with well qualified buyers, went to auction and now has the property on the market as a vacant REO for far less than the offers we submitted. Again, a common story…my buyers submitted an offer and the lender kept losing the documents, bouncing around different departments. Finally, the listing agent connected with an officer of the bank who was a client of hers and got the offer to the right people through networking and name dropping. What really scares me is how many people have walked from their home when they receive an auction notice, without having representation of any kind to even see if that lender truly holds the note! If you know anyone who owns property on Kauai who might be at risk of foreclosure, please encourage them to contact me or another short sale specialist to explore options on how to prevent foreclosure. There is hope! Together, we can keep the ghoulies away…. Princeville Condo Update – Is the tide turning? In the middle of writing multiple offers for buyers on Princeville REO and short sale condos it’s a bit confusing comparing our local reality with what we’re hearing on national news. It sure seems like the tide is turning with an increase in buyer activity. 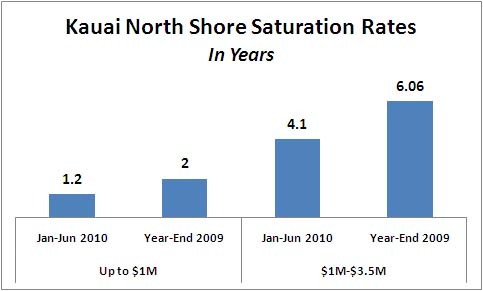 As a way of testing the waters, I looked at year-to-date saturation rates instead of national statistics, which can be very misleading when trying to understand Kauai’s micro-markets. NAR’s chief economist, Lawrence Yun often uses saturation rates when analyzing the health of real estate markets. What is a saturation rate? It’s not the North Shore rainfall…but means how long would it take to sell the current active inventory. At the end of 2009 I did analysis for residential sales in each area of the island, broken down into price categories. To see what’s changed in the past 6 months, this graph compares Year-End 2009 to first half of 2010 for North Shore single family homes. As you can see, there is considerable improvement – especially for homes priced under $1M. For homes priced above $1M, the news isn’t as good. As noted in Kauai Luxury Market – Bouncing Back or Still Bouncing the Kauai luxury market still has more inventory than buyers – which makes it a great time to buy. What does all that tell us? It’s pretty clear we are in the recovery process that Hawaii leading economist Paul Brewbaker predicted when he addressed the Kauai Board of Realtors in August 2008. When asked what the recovery would look like, he predicted it would be similar to after Hurricane Iniki where we’d “bounce along the bottom” – then number of sales would slowly increase. As demand starts to grow, then the values would start to rise. It’s unclear when values will increase, probably not any time soon. But there is a dramatic increase in buyer activity. Here’s Brewbaker’s chart showing the recovery after Hurricane Iniki – see any similarities? 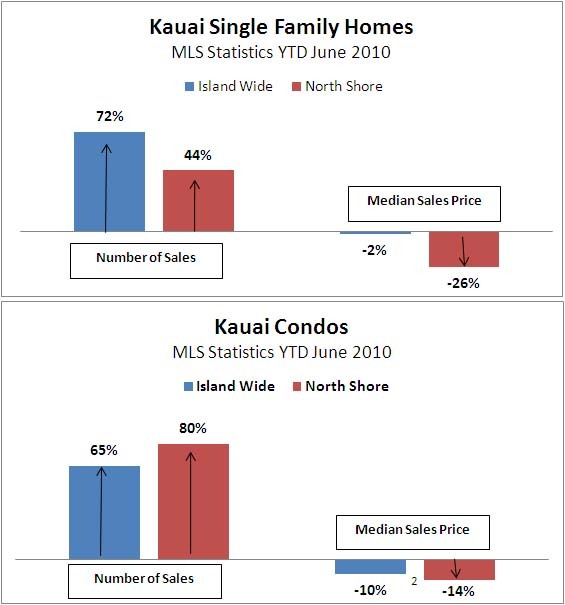 If you’d like the entire Kauai MLS Year-to-date statistics and my saturation report comparing 2009 to June YTD 2010, just email me at susie@koakauai.com. Please add your insights to the Kauai market below. Do you see the tide turning? All data has been supplied by third parties and has not been independently verified by Hawaii Information Service and is, therefore, not guaranteed. Enter your email address to subscribe to this Kauai Real Estate blog and receive notifications of new posts by email.